Important original woodblock print made around 1820 by the artist Utagawa Kunisada (歌川国貞) and depicting a shamisen (三味線) player while tuning her instrument. The work is taken from the famous, and rare, series entitled "Omoigoto kagami no utsushi-e" (思事鏡冩繪), that is "Thoughts Reflected in a Mirror". In the upper inset, a servant washing the feet of a bijin (美人) beauty. 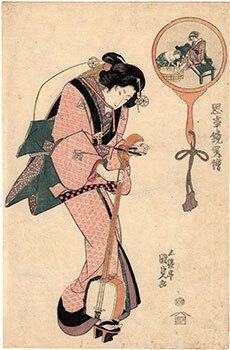 The print was produced by the publisher Matsumura Tatsuemon (松村辰右衛門) and is signed "Gototei Kunisada" (五渡亭国貞), which is the most common pseudonym used by Kunisada before 1844 and which literally means "Kunisada of the Fifth Ferry Pavilion", a reference to the ferry service owned by his family. 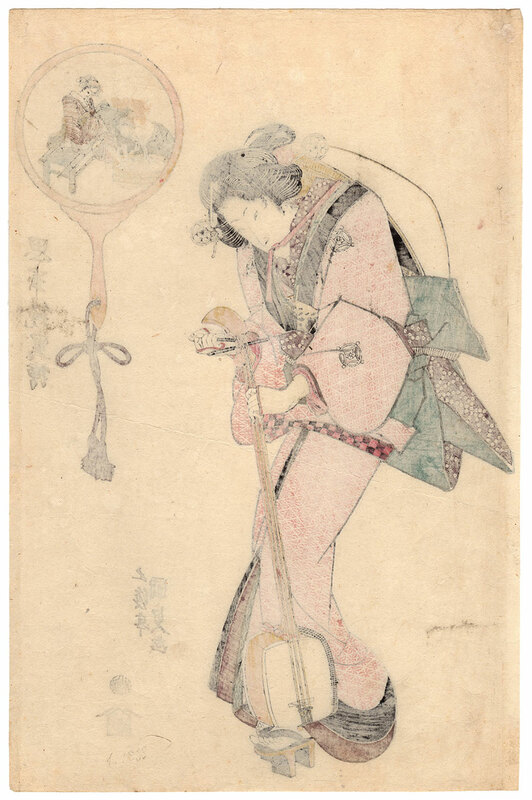 The precious woodcut on Japanese washi paper (和紙), despite the right signs of aging, is in good condition.